Keeping up with the “for one” theme from last week’s stuffed pork chop, I once again tackled a recipe from Around My French Table for solo dining. Perhaps this should be my new shtick. I made a more traditional Basque Potato Tortilla earlier this year so the notion of a shortcut version made with store-bought potato chips is at once intriguing, fun, and a little suspicious. The premise is simple. 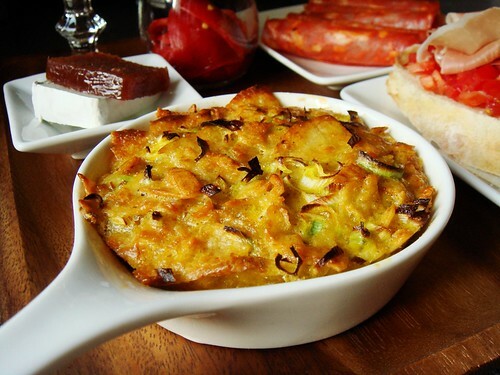 Crushed potato chips are mixed with leeks, eggs, and seasonings to cook until it sets into a thick omelette. As simple as the recipe is, I had my doubts but it had nothing to do with potato chips. After all, Sam & Sam Clark of Moro advised me to fry up some potato chips to make tortilla. Using store-bought potato chips is no more than skipping one step ahead. This classic tapas is typically cooked over stovetop. The more traditional recipes would ask you to exercise some spatula gymnastics to flip the tortilla half way through cooking so it browns on both sides. Greenspan’s recipe made it easier for the cook by browning the top under a broiler. Me? I decided to do away entirely with stovetop cooking because I did not have any frying pan smaller than 10-inches. What I do have though are four mini porcelain pans that are oven-safe. Adapting the recipe for oven cooking seems to be the logical choice. 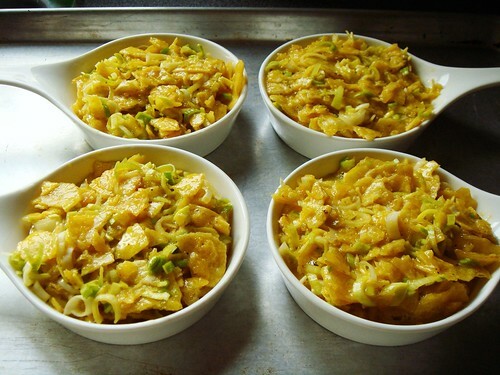 The truth is, I can’t really claim that I followed Greenspan’s recipe. I quickly glanced through the ingredients and directions as my starting point. My tortilla was made very intuitively. First I greased the pans with rendered duck fat when I preheated the oven to 400F. I crushed a 170g bag of plain potato chips (after I snacked away about a quarter of the bag…) and mixed it with a thin stalk of chopped baby leeks, four duck eggs, salt, pepper, and piment d’espelette. I divided the chunky batter between my four baking dishes and baked for about 10 minutes until almost set. Then I repositioned the dishes a little closer to the top of the oven and broiled on low while keeping an eagle’s eye on the tortillas. As soon as they took on a lovely golden hue, they were done. While I waited for the tortilla to cool, I set to make a few other tapas. 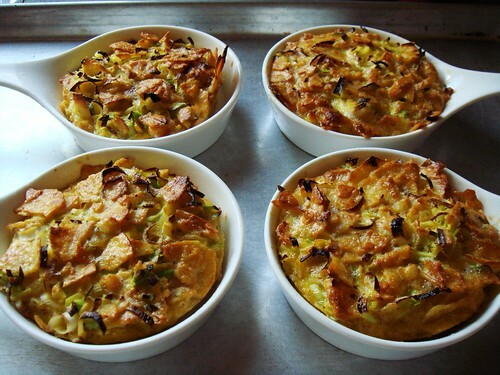 Quite simply put, you can’t have tortilla without a few companion dishes! My platter included chorizo, marinated roasted piquillo peppers, sheep’s milk cheese with membrillo, and pan con tomate y jamon. 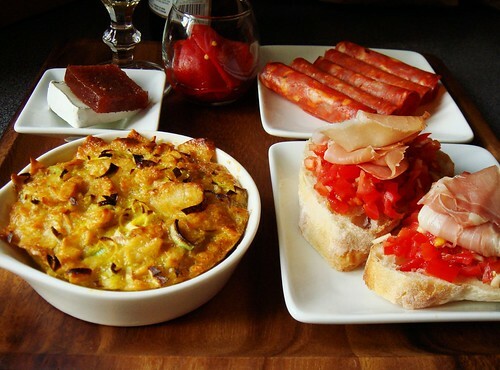 As much as I love the tortilla, I have to say my favourite tapas was pan con tomate y jamon. This Catalan specialty is simplicity in itself. I rubbed a couple slices of ciabatta bread with garlic and drizzled with some fruity olive oil (time to break out the good stuff!). I minced a handful of grape tomatoes along with half a clove of garlic and tossed with a pinch of fleur de sel. 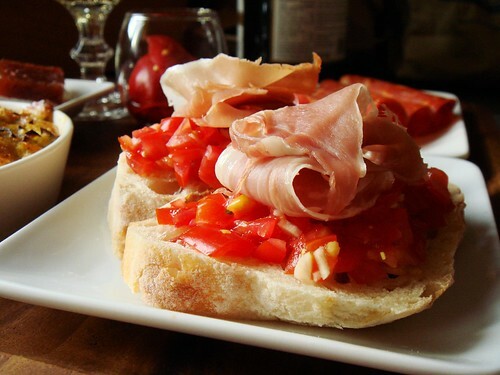 Generously top each slice of bread with the juicy minced tomato and a ruffle of Serrano ham. This cousin of the more well-known bruschetta is a fresh counterpoint to the rich tortilla. Love it! Can you think of a better way to kick off my weekend? Oh wait, yes, a few good friends and a pitcher of Sangria would definitely be an improvement. But if you happen to be on your own on Friday? 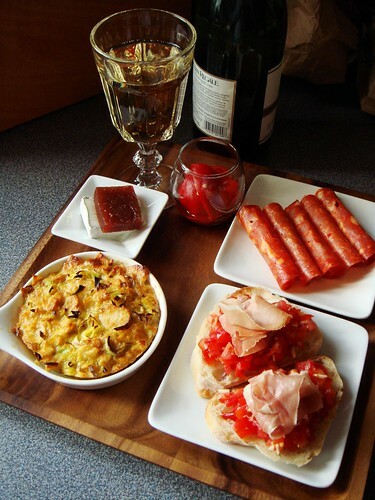 Follow my example and enjoy some tapas for one! You can even check out other bloggers’ rendition of the potato chip tortilla between sips and bites. Oh oh oh! And if you want to make my weekend extra extra special, please vote for my entry in the Pimp That Preserve contest by liking my photo in the Facebook album? It’s just a click away! Speedy recovery, StephIrey and Culinary Diva! Foodiva suggested mixing and matching different chip flavours. Mind, blown. I am absolutely jealous over Sanya Living’s photo of the backyard. It’s summer down under! I can stare at Soup Addict’s photo all day long. The contrast of the rustic background with the golden tortilla is mouth watering. Leave it to Tasty Trix to give us Crispy Kale Chip Tortilla! In case you’re curious…yes, I’m addicted to buying miniature plates and glasses and all kinds of dinnerware….as long as they are small.